Many people believe the secret to a calm, happy home is an organised, clutter-free space. But how do you create order and keep all that clutter at bay? The answer is smart, effective storage. Well-planned systems can make an enormous difference to the smooth running of your home. When storage works well, everything has its place which means that essential items can be located quickly and easily. But it’s not just about functionality. With the right design help, storage solutions such as bespoke cabinetry and elegant shelving can become a thing of beauty in your home and make a real aesthetic impact. Here we look at some of the different types of storage we’ve used in recent interior design projects, and share our top tips for creating effective storage solutions. A great way to maximise storage space is to use full-height bespoke fitted cabinetry. For our Richmond project, the client requested library shelving for their large hallway as well as a ‘hidden’ work space. 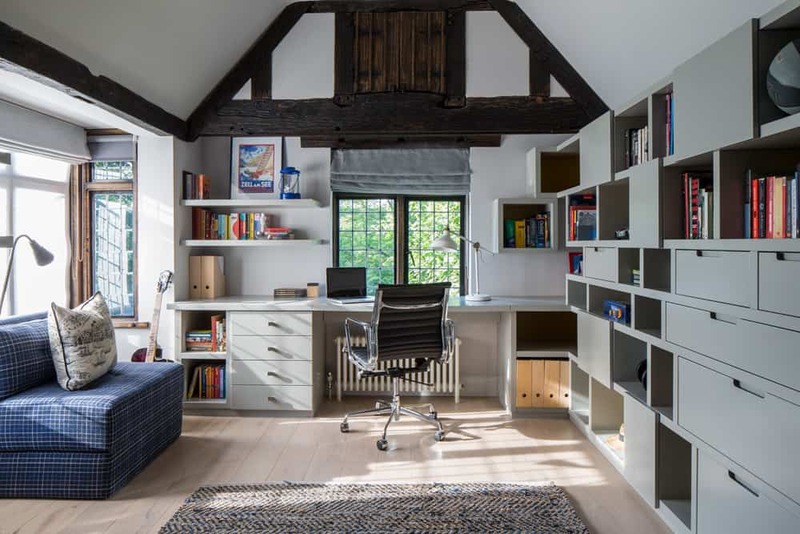 The solution was floor-to-ceiling shelving and a large timber pocket door which slides away to reveal a built-in desk and additional storage. The hidden desk was a specific requirement to provide the client with the option to close off the work space quickly if necessary. 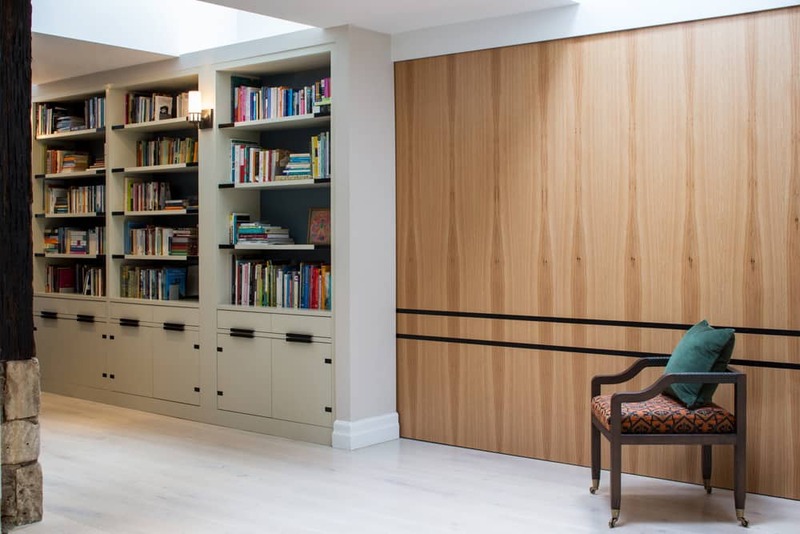 From an aesthetic point of view, the solid timber door provides a beautiful clean break in the space and sits perfectly alongside the extensive collection of books on display. The soft grey painted shelving with metal accents provides the perfect contrast to the timber door to create a stunning feature in this bright, open-plan space. 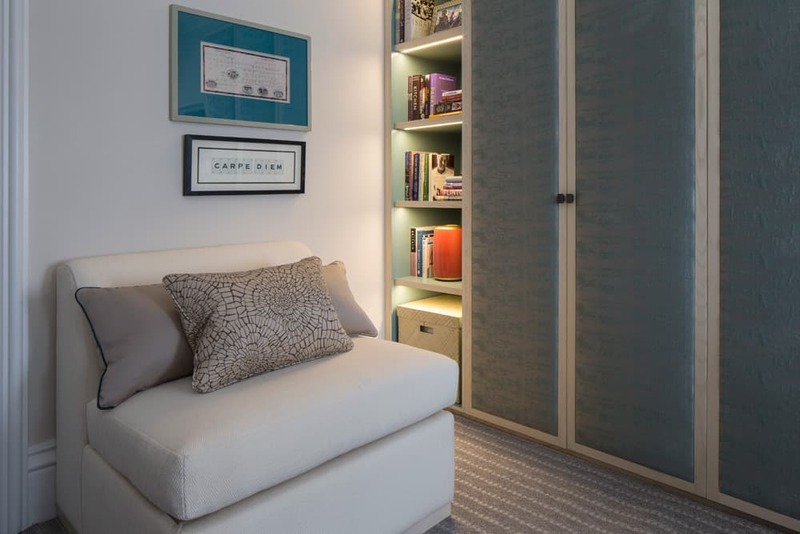 Creating adequate storage in a bedroom is absolutely essential and floor-to-ceiling bespoke joinery is the most effective way to maximise space. 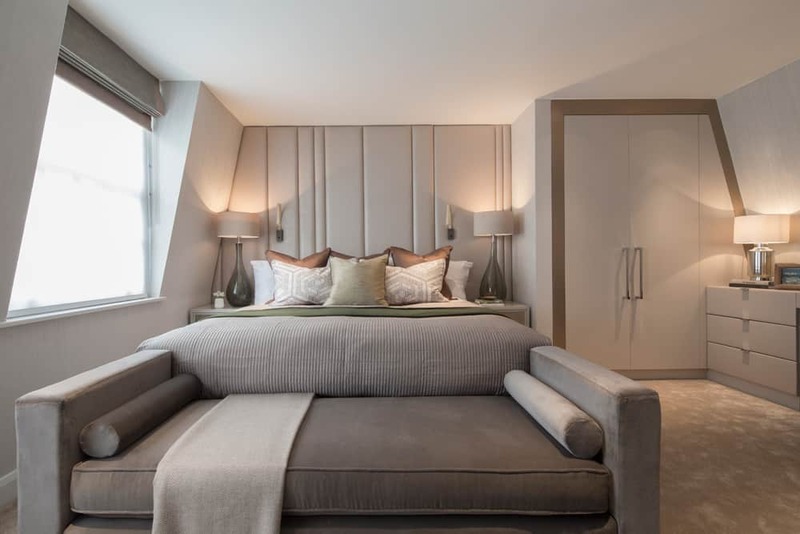 For our Eaton Mews North project, the client wanted to create a generous master bedroom on the top floor of a mews house which meant that the eaves had to be factored into the design. To maximise space, we used a stud wall to define the bed area and to create a flush finish for the recessed wardrobe which was built under the sloping ceiling. The dressing table is also built in and extends across the full width of the wall to highlight the cohesive nature of the joinery. For the master dressing room of our Richmond project, bespoke ash veneer joinery was fitted right up into the apex to maximise space. Vertical and horizontal inlays and antique brass handles make the wardrobes feel part of the architecture. 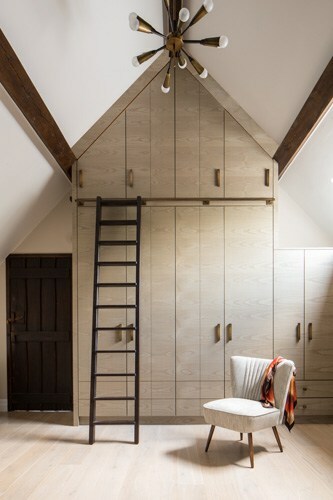 And the dark timber library-style ladder allows access to the highest cupboards while providing a pleasing contrast to the lighter veneer of the joinery. A multi-functional room needs extra thought when it comes to planning out storage and making furniture choices. A neutral palette and some carefully considered built-in joinery can help create an elegant, streamlined space which can be used for a variety of purposes. In the case of our Bromptons project, the clients wanted a study which could also double up as a bedroom for their grandchildren. 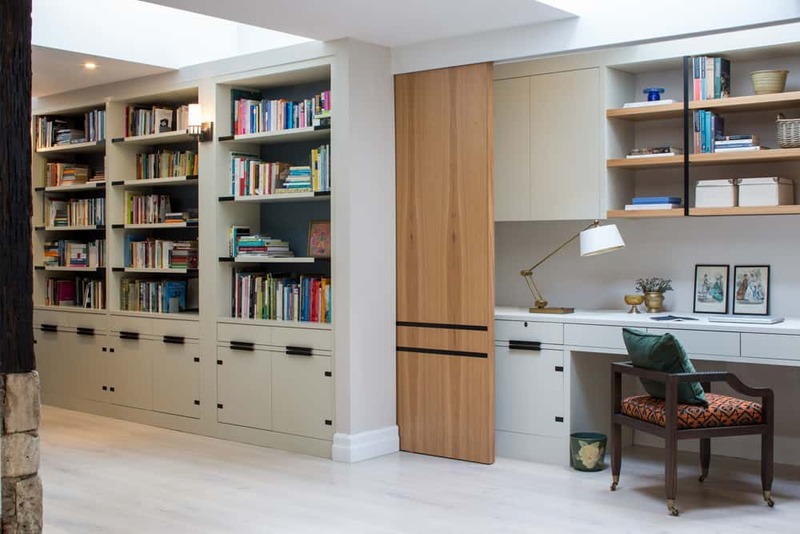 We chose soft, muted tones alongside bespoke joinery which included a combination of open and closed storage. The purpose-built desk in grey-green oak can be kept clutter-free thanks to the high level, discreet shelving. And the single sofa beds at opposite ends of the room can be used as armchairs or beds according to the client’s needs. 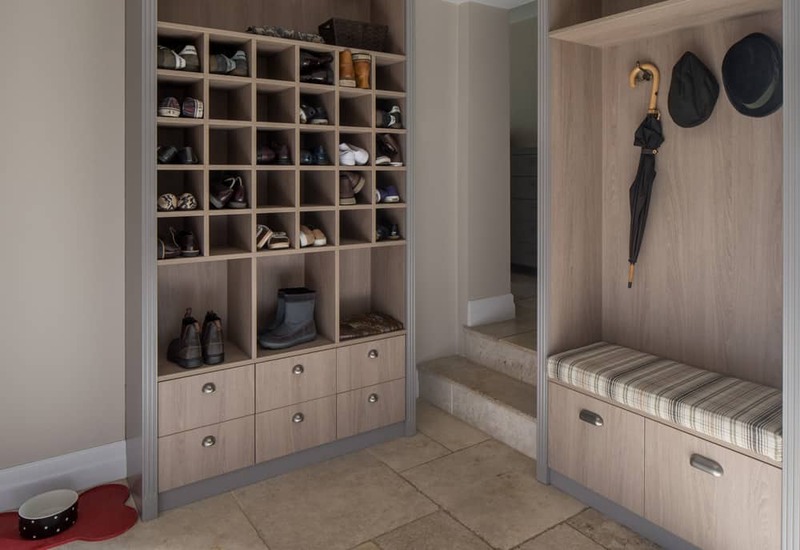 If space allows, a designated boot room can be a great asset to the home in terms of keeping mud and clutter out of the rest of the house. A crucial consideration when planning this space is the type of storage to choose. We recommend including a combination of cubby holes for easy access and closed-in drawers or cupboards to house more unsightly items. For our Richmond project, the boot room was designed around the needs of a family of four and their dog, all of whom spend a lot of time outdoors. Cubby holes finished with ash veneer were the perfect solution to ensure shoes and boots could be easily accessed. And the bench seating allows the children to quickly change their shoes as they’re coming and going. It’s important to allow for plenty of storage for books, toys and games in a child’s room, but don’t forget to also make it fun! Why not incorporate a ladder to access high shelves or even build a swing or a climbing wall into the joinery? 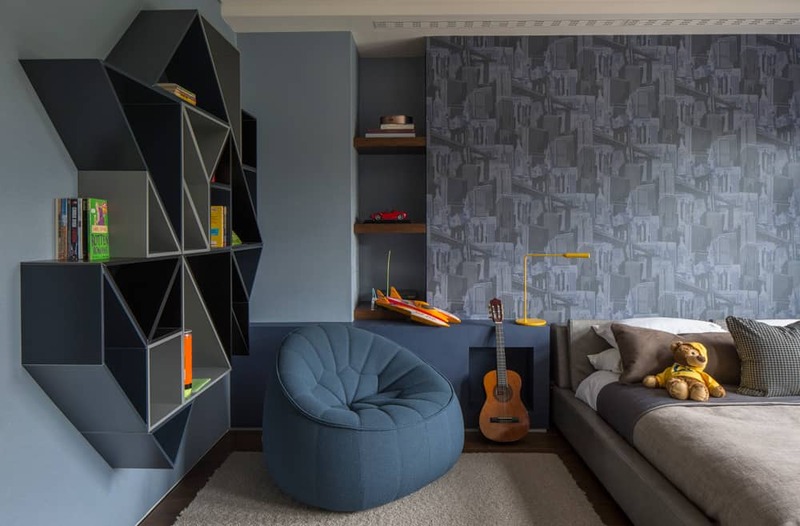 The geometric shelving we used in the boy’s bedroom of our Broad Walk project was a great way to add individuality and colour. We always chat to the children to find out more about their personality and how they intend to use the room. For example, for the boy’s bedroom in our Richmond project, he wanted to be able to keep his desk clear, so we created a run of shelves and pigeon-hole storage down one wall to allow him to tidy away all his books and games. We also chose a neutral colour palette to allow for easy updates as he gets older. It’s worth considering a variety of textures for the finish of your storage cabinetry to prevent it looking one-dimensional. 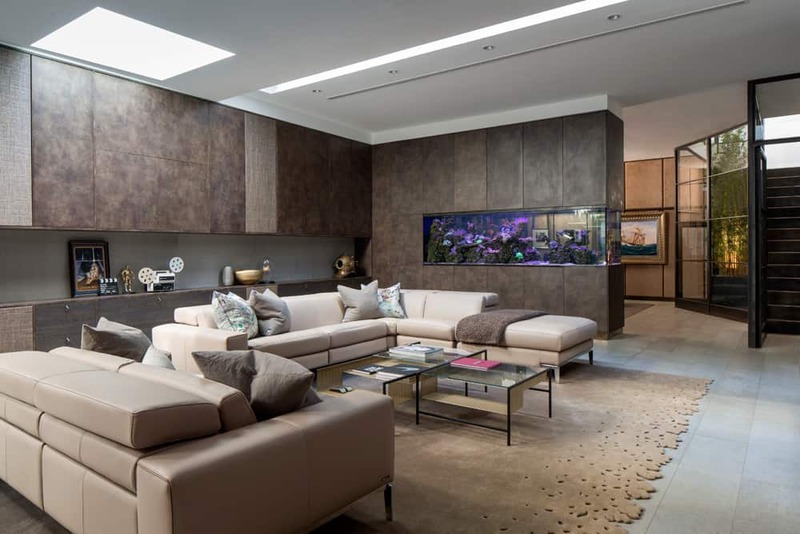 In the basement of our Antrim Grove home, the joinery incorporated an aquarium of tropical fish as well as bronze-coloured cupboards and shelving. The addition of accent lighting can also create interest and drama. Using lighting to illuminate rows of books, albums or personal objects in alcoves can add warmth and character to a room. 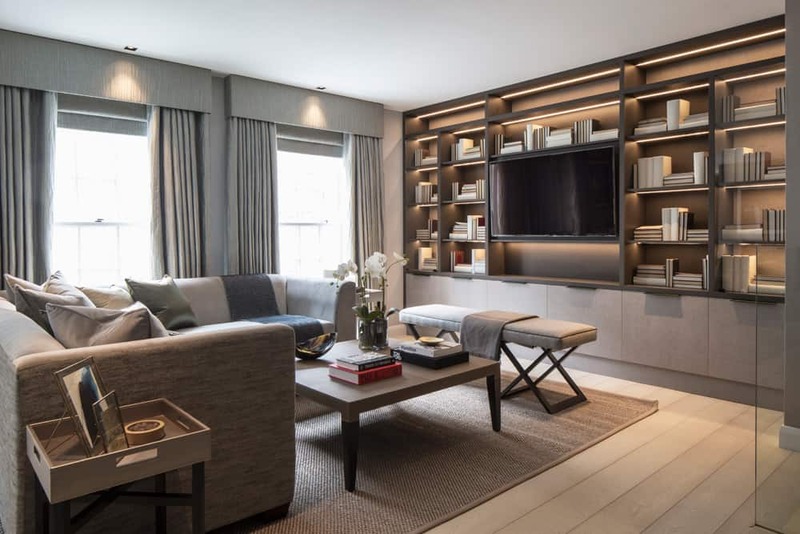 In the living room of our Eaton Mews North project, the alcoves were all individually lit which completely transformed the look and feel of the space. The secret to effective storage lies in the preparation. Think about what you need to store, where you want to store it and how big the items are. Then design the storage solution around these requirements. Job done! 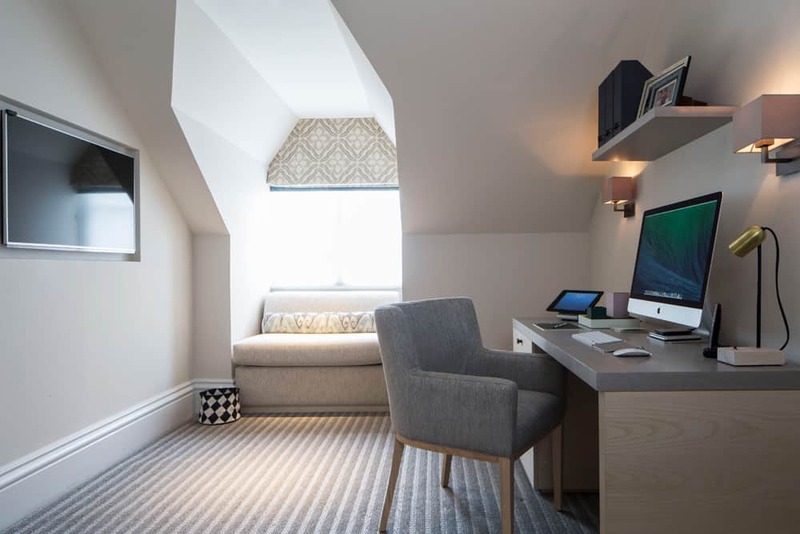 Bespoke joinery is the best way to make the most of the space available – especially if you are working with low ceilings or awkward-sized rooms. The other benefit of built-in cabinetry is that cupboards and shelves can be designed to fit your specific storage requirements. Storage is primarily about function and usability, but don’t forget to think creatively and make it fun! Our work often involves creative elements such as geometric shelving, reading nooks or access ladders. Our clients always love it when we turn something functional into something beautiful and surprising!